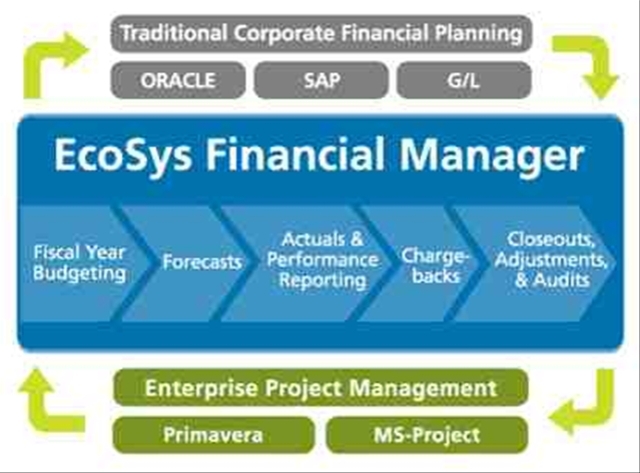 EcoSys Financial Manager (FM) is a web based enterprise project financial management system. Project financial management involves all aspects of managing and monitoring the flow of funds from the organization into discrete initiatives, programs, projects, and ongoing operations. 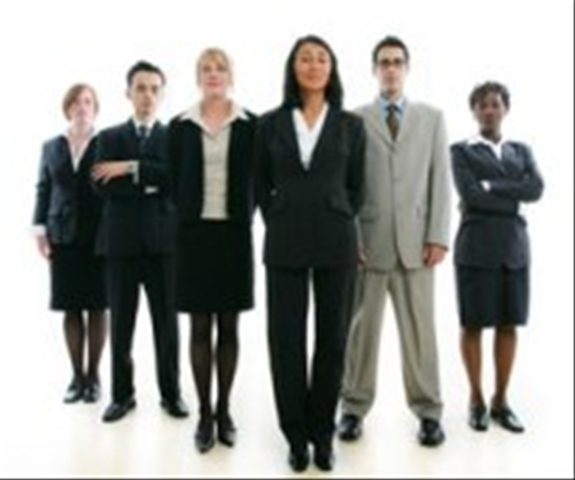 These discrete efforts execute and should align to strategic objectives and priorities. The project financial management cycle encompasses long range planning, fiscal period budgeting, forecasting, spending requests, allocations, performance measurement, controls, closeouts, and adjustments. Large organizations need to be agile and responsive - financial processes and workflows need to flow top down and bottom up. Finance and Accounting needs to reconcile information flowing in both directions: down from executives responsible for strategic planning and up from the people in the field who are close to the work required. EcoSys FM successfully bridges corporate strategic planning and project financial management for our customers in a varied range of industries. 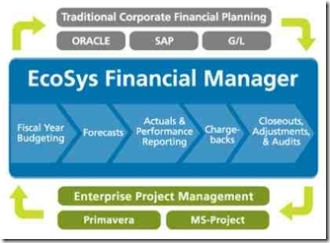 Particularly if you are looking to integrate project management with financial management, EcoSys FM is a proven solution in organizations using Primavera and other enterprise project management systems. I’m currently working as an associate consultant with an organisation called BeLife Ltd. We are interested in showing organisations how they can transform their Oracle Reports using BI Publisher (formerly XML Publisher) and would like to offer a free 1 hour demonstration of this product to anyone that’s interested. BI Publisher is standard Oracle Financials integrated functionality, but it is only used by a few organisations. Recent feedback suggested that this is because organisations just don’t know how to start with using BI Publisher even though users are eager to experience the benefits. We’d like to show you in an hour how you can get started. Management information reports with tables, graphs and conditional formatting. Whether you’re a super user, end user or implementor if you’re interested in potentially using this reporting tool or know of anyone that may be interested in a demonstration please contact me. 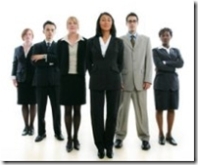 I recently created an Oracle Contractors Group on LinkedIn. The purpose of this group is to create a network for contractors to talk to each other as well as discuss and refer work opportunities. If you’re interested in joining sign up to the LinkedIn group and I’ll approve your membership. Over the last few years I’ve been involved in interviewing a number of Oracle Financials Consultants and have also in the past been sitting on the other side of the desk as an interviewee. The last time I conducted an interview it was more technical in nature and I decided to came up with a list of questions to ask the interviewee. These questions were focused along the lines of people, process and technology and I thought I would write a blog entry with the questions as I’m sure it will be useful for interviewers and interviewee’s alike. In addition to the questions I also developed a score sheet utilising the Kepner Tregoe decision making methodology, an approach I learnt when doing my Masters in Business Leadership (MBL). This score sheet allows the interviewer to develop an objective means of evaluating the answers to interview questions rather than a subjective one and can be modified to suit a number of different scenarios. I haven’t included any answers to the questions as in many cases there is no right answer, I prefer to see if someone understands the concepts and can explain them well. Having said that, if any one wants to come up with a suggested answer sheet I will gladly append it to the questions listing. Hopefully this question listing and score sheet will provide readers with a baseline/guideline that can be used in any type of interview. Explain the organisational concepts of business group, set of books, legal entity, operating unit and inventory organization and the hierarchical structure relating to these. What are the three C’s in relation to a set of books? What is the difference between a cross validation rule and a security rule? What is a value set and what are the different types of value sets that you will find within Oracle? Describe the Key Configuration decisions you would need to undertake when implementing the Accounts Payable module. Briefly describe the Supplier Invoice to Payment process within Oracle. Describe the Key Configuration decisions you would need to undertake when implementing the Accounts Receivable module. What happens when you have a receipt in Oracle that can’t be applied to an invoice? Describe the key configuration decisions you would need to undertake when implementing the fixed assets module. Briefly describe/draw the asset additions process within Oracle. Describe the key configuration decisions you would need to undertake when implementing the cash management module. Outline the Statement to Reconciliation process within Oracle with particular reference to the different options you might want to consider when reconciling. Describe/draw the sequence of events you would undertake in closing the various financials modules. Draw a typical structure relating to project implementation and describe the role each person would play within a project. Describe how to implement an effective training strategy within an implementation – include the timing of training relative to the project lifecycle. Within an implementation describe a Change Management strategy that you would put in place. Describe/draw the main phases of an implementation lifecycle and the key milestones and deliverables within each of these phases. Within a project describe the different test phases that you might go through and what level of testing would be undertaken. Describe a typical process you would implement for managing Change Requests and Bug requests within your organization. 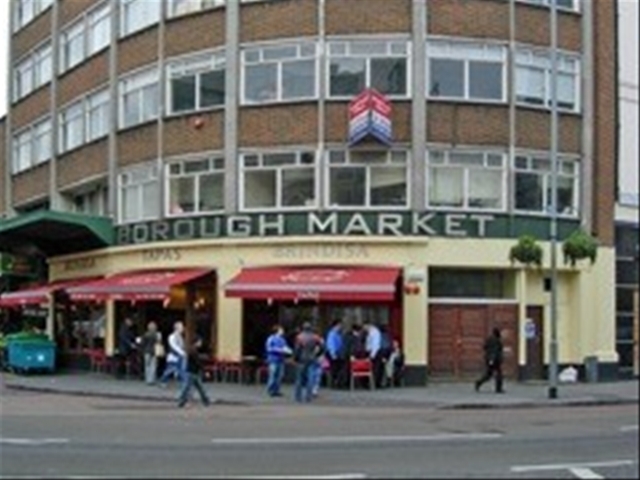 Next week we’re having a UK Oracle Apps Contractors, Consultants and Blogger Meetup at the Tapas Brindisa in London. 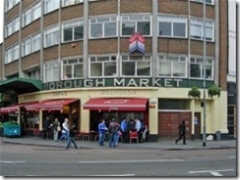 If you fit into any of those categories and would be interested in coming along and meeting myself and other Oracle Apps Fans for a drink and chat then please join us at 7pm on the 13th February 2008. The event was initiated by Simon Tomey of BeLife and I’ll be joining in along with some of his colleagues and friends. Although its a social I’ll be there with my laptop and internet connection so we can always do some techy stuff. If you need any further information don’t hesitate to contact me. I’ve also created an event in Yahoo’s upcoming calendar tool so that you can automatically add the details to whatever calendar software or application you are using or let us know whether you plan to attend.